In addition to offering exceptional service and hospitality, each American Mortals location is designed to be a warm and welcoming environment that celebrates the individuality, personality and eccentricities of our stylists, clients and the neighborhoods themselves. Each location carries a full line of shampoos, styling, grooming, and shaving products from R&Co and V76. A stone throw from the birthplace of our nation, our original location has been a constantly evolving hub of palpable energy since first opening in 2001. Make sure to check out our murals from local artists Nosego and Lauren Cat West. American Mortals Washington Square also has installations from some of Philadelphia’s best and most innovative artists, changing every quarter. Our newest location is an eclectic gem with surprises in every room. Don’t miss the stained-glass windows when you’re in the shampoo bowls or the retro, 70's inspired processing area. 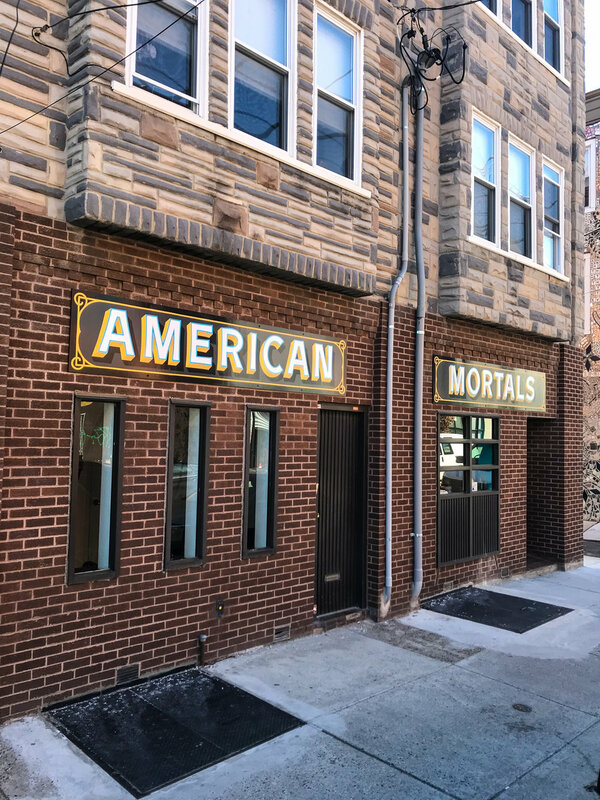 American Mortals Queen Village also offers a private room upon request for local celebrities, visiting artists, or anyone that wants a quieter experience, away from the hustle and bustle of every-day life. Our two-chair South Philly location is full of charm inside and out. American Mortals Graduate Hospital has the intimate charm of an old barbershop, with the same full service, color/cut/styling options of our larger locations. The giant windows are ideal for watching all of the dogs passing by, and if you’re timing is right, you’ll get to see Otis, the neighborhood basset hound.